S.G. Night has had stories growing in his head since birth. He began the final version of "Attrition" at the age of 14, and finished shortly before turning 18. He's a storyteller, a cynic, and a libertarian - he does things his own way. A sucker for puppies and English musicals about French people, Night enjoys the winter, writing before the break of day, and the company of fire. S.G. Night's Attrition: The First Act of Penance is a sweeping tome filled with adventure, history and magic. Io is in turmoil. The Demon Dominion has enslaved humanity, banished the elves and eradicated the Majiski. Racath Thanjel, one of the last surviving Majiskis, has lived in the shadows for most of his life. Trained as an assassin, he must find a way to become more if he ever wishes to remove the Dominion's yoke and free Io. Guided by a girl who can see the future and trained by the best his race has to offer, Racath needs to unlock his Majiski gifts and be the hero he is prophesied to be. The problem with long books is that if they turn out to be good, I lose an entire night's sleep. S.G. Night's Attrition was well worth it. It was quite difficult to get through the first chapter. But once I was through, the entire world of Io was mine to enjoy. Characters in fantasy settings live in a world with history, science and lore. A fictional world should have all the aspects of the real one. S.G. Night did a marvelous job of making his world come alive. Some of the expositions may seem a bit forced but, all in all, Mr. Night managed to introduce his world to readers without overtly detracting from the narrative. Racath Thanjel is almost always on the verge of being an over-powered hero, but the author manages to bring in circumstances that challenge his protagonist. I particularly love the novel's supporting cast: Alexis, Toren, Rachel and Notak. It takes a lot of great writing to make the reader like the supporting cast of such a hero-centered saga. 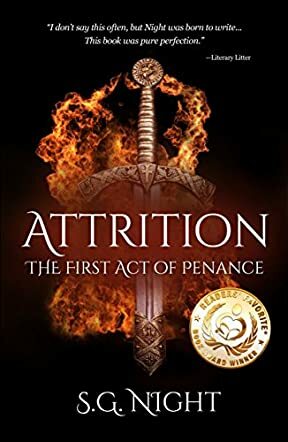 S.G. Night's Attrition: The First Act of Penance is the first of three parts. First volumes are supposed to pique reader interest, introduce characters and set up the fantasy world. In all these facets of fantasy, S.G. Night did an amazing job. I, for one, would willingly trade a sleepless night just to enjoy more of his work.